I'm on Patreon to PTSD Awareness to centerstage - literally. A full production of "Imprints" at the New York City Thespis Festival in January 2017 will require $10,000. Every bit counts, and we appreciate any bit of help you can provide. More details to follow! Trauma affects everyone differently, but creativity can be a lifeline for everyone and start a vital message for society. 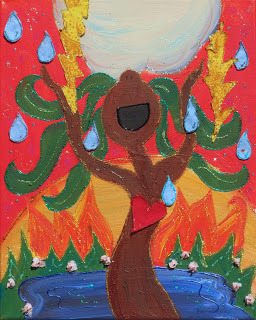 To celebrate how the arts can heal trauma, I will make one creation a day. What will I paint/write/sing/perform/share/sculpt tomorrow? I'm an artist, finding inspiration from daily life experience and an life-shattering experiences. After almost losing my life at 18 years old, I celebrate life's daily miracles through my art, theatre, music and writing. I HAVE A HUGE GOAL: To mount a full production of a full-length drama I've worked on for six years about my life, a survivor and "thriver" of sexual abuse, 27 surgeries, coma, organ failure, six years being unable to eat or drink, and the PTSD that comes from ten years of trauma, starting from my senior year of high school. Learn about it here. So, my life didn’t go exactly as I planned it – but does anyone’s? I also, wrote a one-woman musical about my life, Gutless & Grateful,which I tour not only to theatres, but to colleges, conferences, shelters, hospitals and organizations as a sexual assault prevention and mental health advocacy program. With your pledge, my goal is to reach even more students, survivors, health advocates, teachers, leaders and allies with my message of gratitude, hope and resilience. I’m a PTSD peer-peer specialist, artist, author, writer for The Huffington Post, speaker for TEDx and RAINN, award-winning health advocate, actress and playwright. As a survivor and “thriver” of nearly 30 surgeries, a coma, sexual abuse, organ failure and a decade of medical trauma, I’ve been challenged with moments of extreme difficulty. But as an artist, actress, author, dancer, foodie, 29-year old college student and overall lover of life, I'm grateful that these "beautiful detours" have made me who I am today. 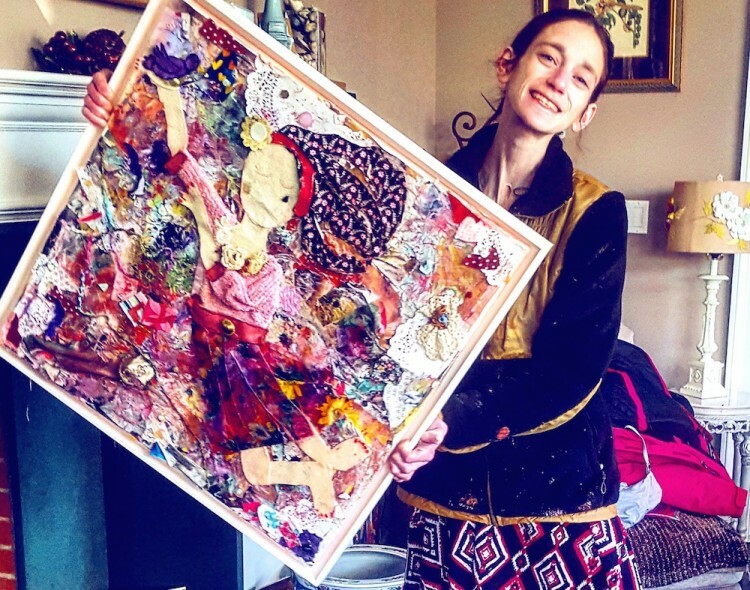 Because of my ten-year surgical marathon, I discovered the world of mixed media art as an amazing way to express what I had been through. Now I'm addicted to creativity because it saved my life, and I share because I think it can improve anyone's life! I hope my story (and what I've done with it) inspire you to navigate your own "life detours" by simply following that unexpected path, and turning obstacles into creative adventures...which ultimately become opportunities! Now 29 years old, I'm a visual artist, theatre artist and writer with a story to share with you...and a mission to guide others through their own detours and unexpected paths. Creativity is my lifeline. Through the highs and lows of the past decade, I have been creating hundreds of pieces of art, speaking at various conferences,performing nationwide, and building other creative minds along the way.My biggest dream is to get this empowering inspiring message out there in the largest way possible - the stage. Theatre changes lives! Along with my show, I'll be leading mixed media art and creativity workshops to bring out the artist in us all - because trust me: when life gets shaky, we need to bring our inner artist out as a survival skill. 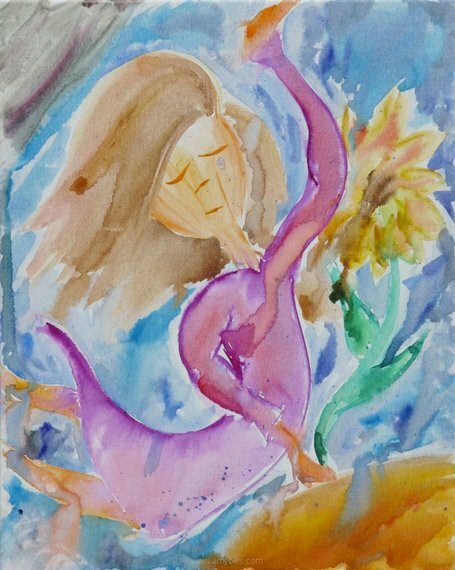 Creative Expression empowers us when life feels out of our control, and I believe EVERYONE deserves to create. Help me make that happen for the world! I want to build this journey with you. (Level 1) (two dollars per month) get on the exclusive mailer where I share tips, tricks, and amazing ideas - get a (#LoveMyDetour) official logo to show you're part of the movement! (Level 2a) (5 dollars per month) all of Level 1, AND you will be on the short list for art tutorials AND an open-questions roundtable where I answer real questions about art, creativity, or your artsy topic of choice. (Level 2b) (5 dollars per month) all of Level 1, AND you will be on the short list for art tutorials AND an open-questions roundtable where I answer real questions about Health/Mental-Health. (Level 2c) (5 dollars per month) all of Level 1, AND you will be on the short list for art tutorials AND an open-questions roundtable where I answer real questions about Theatre - I'm talking anything from musical theatre ad composer trivia, how to write your own show, what's my inspiration, polishing your monologue, marketing yourself as an actor, or how to break into the biz! (Level 2d) (5 dollars per month) all of Level 1, AND you'll receive weekly inspirational quotes, poems and writings - all original, never before seen, and customized for you, to help you on your own journey. Trust me - I'm a writer fueled by unique, inspiring life experience. I'd love to share my inspiration with you! (Level 3) (10 dollars per month) all of Level 1, 2x, AND I will write you a monthly poem - the topic is your choice - anything, for anyONE, on any occasion! It's the perfect meaningful present for a friend! Level 4A ($40) You'll get a writing power session with me! Send me what your working on and I'll gladly look it over and help you with the edits, adjustments or revisions you need! Check out my writing portfolio to see a bit of what I've done! Level 4B ($50) Not only will you get a writing power session with me, you'll get coaching on how to get your piece published, where to get it published, and how to turn your passion for writing into a business, or to take your business of writing to the next level! First of all, you’ll get my unending gratitude for supporting my passion for the arts to help others transform adversity into creative growth. Anyone can be an artist – and my biggest thrill is bringing that out in others. It doesn’t matter what you pledge – it’s truly the thought that counts. Your donation is a beautiful acknowledgement that creativity is a mindset, a survival skill, and the best way for anyone to find joy! Secondly, you become my inspiration, turning my own mission into helping you find your own creative voice. On my blog, I get tons of comments and emails asking me about certain techniques that I’ve created over time – I’m completely self-taught, so all of my “techniques” are uniquely me. At first, I loved sending people step by step instructions on how to create some of my favorite pieces, and some of my tips really caught, but because of the amount I receive now and there being sonly so many hours in a day, I feel terrible that I can’t respond to every one of them! So, eventually I try to get around to everyone because I think creativity NEEDS to be shared, but you will definitely be my first! Thirdly, you’ll get exclusive live content of me in my studio, painting for hours and going with the flow until somehow, a new canvas gets made – you’ll be amazed at what I can come up with by just throwing paints on a canvas and banging it around! In live footage, anything can happen, and since I also happen to be a singing, dancing musical theatre ham, who knows, you might even get a bit of song and dance in there as well! And finally, you also get exclusive patron only access to the entire archives of not only behind the scenes work in my art studios, but backstage footage of me performing, and life on tour! I have a pretty crazy life (which is probably why I’ve been offered a reality show a few times!) between my stomach exploding, touring a one-woman musical about my stomach exploding, having to eat 6000 calories a day because of my stomach exploding, and a lot of other crazy random things that have nothing to do with my stomach exploding, but sure have to do with my insatiable hunger for life! Plus, my adorable Pomeranian and toy Australian shepherd will probably make a few appearances. I'm working on more rewards to show my appreciation of your support for this crazy dream of mine, so expect more to come! My “beautiful detour” has inspired a passionate desire to create and help others. My writings have appeared inWashington Post and On Being with Krista Tippet, my story has appeared on the TODAY Show and CBS, and my one-woman show has been seen in theatres across the country, earning rave reviews and accolades since it’sBroadwayWorld Award-nominated NYC debut. It’s also the name of my upcoming book and TEDx talk! I’m so excited to share the lessons learned from trauma with you, and hope to bring out the detours that unite us all through my writing, mixed media art, performance and inspirational speaking. …so follow that detour and discover the beauty in the road less travelled! Or see where my detour is headed next in my event calendar! Level 1: Get on the exclusive mailer where I share tips, tricks, and amazing ideas - get a (#LoveMyDetour) official logo to show you're part of the movement! Level 2: You can pick from A, B, C or D! A: all of Level 1, AND you will be on the short list for art tutorials AND an open-questions roundtable where I answer real questions about art, creativity, or your artsy topic of choice. B: all of Level 1, AND you will be on the short list for art tutorials AND an open-questions roundtable where I answer real questions about Health/Mental-Health. C: all of Level 1, AND you will be on the short list for art tutorials AND an open-questions roundtable where I answer real questions about Theatre - I'm talking anything from musical theatre and composer trivia, how to write your own show, what's my inspiration, polishing your monologue, marketing yourself as an actor, or how to break into the biz! D: all of Level 1, AND you'll receive weekly inspirational quotes, poems and writings - all original, never before seen, and customized for you, to help you on your own journey. Trust me - I'm a writer fueled by unique, inspiring life experience. I'd love to share my inspiration with you! (Level 3) (20 dollars per month) all of Level 1, 2x, AND I will write you a monthly poem - the topic is your choice - anything, for anyONE, on any occasion! It's the perfect meaningful present for a friend! (Level 4) (25 dollars per month) all of Level 1, 2x, AND you will get access to the (weekly/monthly) live stream of me in the studio making something inspired by a loyal community member. You'll get a writing power session with me! Send me what your working on and I'll gladly look it over and help you with the edits, adjustments or revisions you need! Check out my writing portfolio to see a bit of what I've done! This is the extra-special Patron's package, and wow, I will REALLY owe the premiere production of Imprints to you! You'll be left with the everlasting reward of bringing PTSD Awareness to the stage, starting a vital conversation for society. Plus your pick of any of the previously mentioned perks! You'll also be given a super-exclusive gratitude placement in the program, site, and all promotional materials for the New York Production! Where in earth did you come from? You'll get any of the perks previously listed. You'll also get an exclusive copy of the production's premiere, and not only a listing on my site and program for making the New York premiere possible, but all performances and presentations for the upcoming year! If I could make you president, I would - but even better, you'll get everything listed in the previous award, plus, I'll ship you a personally signed top notch lithograph 18 x 24 poster print of my first original mixed media painting, Singing Tree, now kind of my hallmark painting, and the first time I ever picked up a paintbrush. It means the world to me to be able to give you a copy of the painting that brought so much joy to my life in the darkest of times. An extra piece of content every week! With a bit of extra funding, I"ll have even more time to create. That means more art to share, more inspiring articles like this popular one, more songs, more tutorials, and more inspiration! Fun videos too, of course!